ELEVEN-YEAR-OLD Toby Armstrong says he knows what it feels like to have a sword cut through his bones. That was his first taste of chemotherapy. "It was the worst pain I'd ever felt in my life... it was gut-wrenching," he said. The two months of bone pain was among his first, and still most difficult experiences, after he was diagnosed with chronic myeloid leukaemia. The treatment was to "kill off" some of his white blood cells, from head to toe. For people who have CML, more commonly seen in adults, the bone marrow produces too many white blood cells, called granulocytes. The "immature" white blood cells in Toby's body means his immune system will always be compromised. 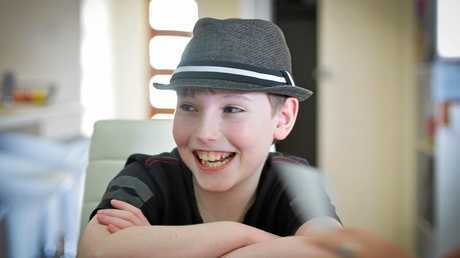 Diagnosed on his 10th birthday, Toby has spent the past 15 months learning how to live with cancer. The once energetic boy who loved jumping on the trampoline has changed, but he has not lost his resilience, confidence and charm. Sitting at the kitchen table in his family's Kirkwood home, Toby says chemotherapy is easier now. The oral chemotherapy, which costs $160,000 a year and is Federal Government subsidised, causes nausea and fatigue. It also makes his skin sensitive to the sun, which limits his time outside. 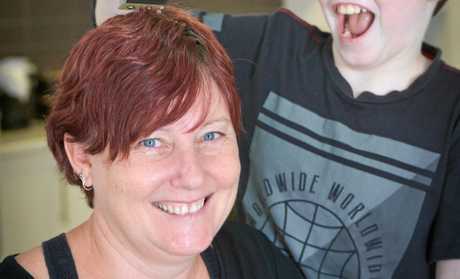 With one hand on his mum Alicia's arm for support, the courageous boy, who is well-known at Gladstone and Lady Cilento Children's hospitals, said "it's not fun". Toby is the reason Alicia will shave her hair to a number two and dye it green on March 17 for the 20th anniversary of the World's Greatest Shave. "He's resilient," the mum of five said. "He's my little inspiration. "If he can get through a day with cancer, I can get through anything." Despite the obvious challenges, Alicia and Toby say in many ways their family is still lucky. The oral chemotherapy means Toby does not have to spends weeks or months having chemotherapy at hospitals. They're also thankful for the medical trial Toby has had great results from since diagnosis. He has been taking Imatinib, a medication used specifically to treat CML. "Fortunately, I'm doing extremely well, they say it's unlikely my cancer will mutate," he said. 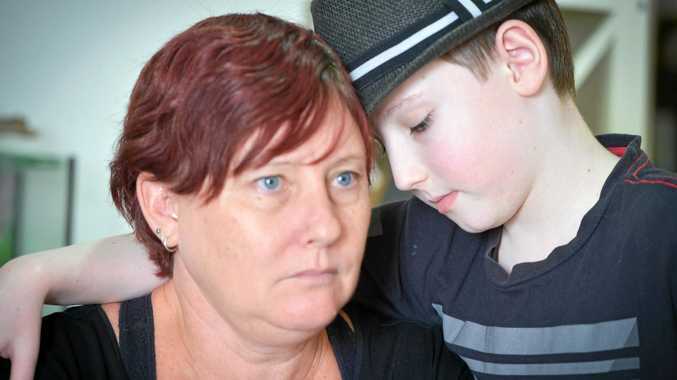 Toby and his mother have had a bone marrow test at Lady Cilento Children's Hospital, but Alicia said she was not a match. Meanwhile, the hospital is actively searching for a match, should Toby need it one day. "They're scouting the world at the moment to try to find a donor for him," Alicia said. "If by some chance the CML mutates and the Imatinib doesn't work, we will need a bone marrow transplant." Living through a "parent's worst nightmare" for the past 15 months, Alicia has gained a new appreciation of the health system and cancer support networks. She said they tried to donate what they could to Amelia House - where they stay during visits to Brisbane every six weeks - and the Leukaemia Foundation. "I'm one of five children and my mum is one of seven, yet before this I'd never been personally touched by cancer," Alicia said. "I'd heard of leukaemia but I didn't understand what it actually was. "Unless it touches you, you don't really think about it... so it was very scary when all of this started." Alicia will lop her locks for the Leukaemia Foundation on March 17 at the Tannum Sands Hotel. She hopes during the fundraiser Toby will be able to reunite with the House Call Doctor who was called when he first became sick. To donate, visit the World's Greatest Shave website and search Alicia Armstrong.